In medium bowl, stir baking mix, milk and cheese with wire whisk or fork until soft dough forms; beat vigorously 30 seconds. On ungreased cookie sheet, drop dough by 10 to 12 spoonfuls about 2 inches apart. Bake 8 to 10 minutes or until golden brown. In small bowl, stir butter and garlic powder until well mixed; brush on warm biscuits before removing from cookie sheet. Serve warm. 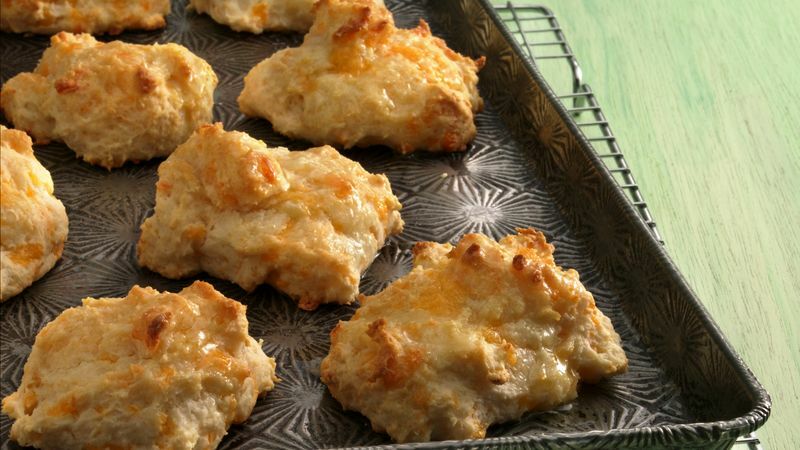 For 2 grams of fat and 105 calories per serving, use reduced fat baking mix, fat-free (skim) milk and reduced-fat Cheddar cheese. Increase garlic powder to 1/2 teaspoon; stir in with the baking mix. Omit butter. Spray warm biscuits with butter-flavored cooking spray if desired. Stir in 3/4 teaspoon dried dill weed, dried rosemary leaves, crumbled, or Italian seasoning with the baking mix.